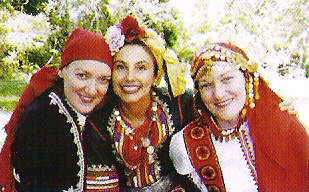 Trio Pippero perform on Silvia's latest CD "If I Were a Bird"
Bulgarian open-throat singing is dramatic and severe, but Silvia Entcheva sweetens the effect. The purity of the voice, the pretty, ingenuous face on the cover and the innocence implicit in the traditional Bulgarian songs are all one. And "one" is the operative word as Silvia Entcheva presents a program of largely unaccompanied renditions of her homeland's folk songs. I first saw Entcheva perform solo at the Erskineville Music Festival. She looked like a porcelain doll in her colourful traditional garb and stopped the audience dead as her remarkable voice darted and billowed around in a church hall. Readers may know her as a soloist with the Martenitsa Choir or via her trio with Llew Kiek and Kim Sanders. Bulgarian open-throat singing is inherently dramatic and severe, but Entcheva sweetens the effect by creating such a pure sound. She maintains excellent rhythmic impetus without accompaniment and there are cute thumbnail sketches of the contents of each lyric. Further vocals from Mara Kiek, Jarnie Birmingham and Entcheva's daughters adorn five tracks and a dash of percussion embellishes two more.